Super creamy and fluffy, not too sweet — this is quite possibly the BEST whipped buttercream frosting recipe ever… A must try! Call me crazy, but I’ve never been much of a fan of frosting. More often than not, I scrape as much of it off my cupcake or slice of cake as possible — kids LOVE to sit next to me at parties! But this whipped buttercream frosting? Oh, this buttercream frosting… I personally think it is THE best buttercream frosting recipe. EVER. And I don’t take calling any recipe “the best” lightly. Now I realize that there are really only so many ways to make buttercream frosting. A simple Google search yields thousands upon thousands of results. But a truly delicious buttercream icing is as much about the technique, as it is about the ingredients. We’ll talk technique in just a moment, but let’s begin with the ingredients for this whipped buttercream (and there are just 4 of them! )… Start with fresh, high-quality ingredients: softened salted butter, heavy whipping cream, pure vanilla extract, and confectioners sugar. Yes, I did specify salted butter — I prefer to use salted butter in my buttercream icing recipe. However, you should note that the salt content can vary by brand of butter. My all-time fave is the Horizon Organic brand, but the Kirkland organic butter from Costco is an excellent option, as well. In fact, I strongly suspect that it may actually BE the Horizon brand repackaged for bulk sale. Feel free to experiment to find your favorite, though! Don’t have salted butter on hand? 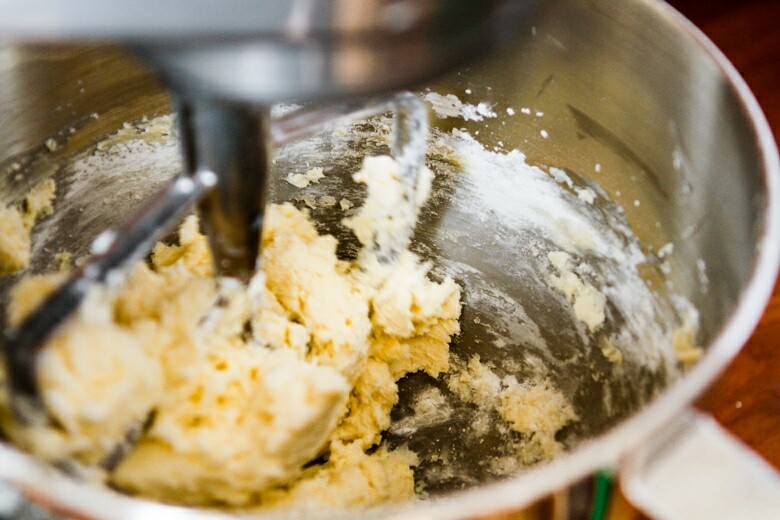 As an alternative, you can also use unsalted butter and add about 1/8 teaspoon of table salt to the recipe. Also, I stay away from adding shortening. Sure, it’s useful for helping the buttercream frosting hold its shape better in warm weather. But I find it creates an oily texture and dilutes the flavor. NOT what we want in a dreamy, fluffy buttercream! Now we get to the technique… Whipped buttercream is the name of the game — super creamy & fluffy and not too sweet! The key to what I consider the best whipped buttercream frosting recipe ever starts with perfectly softened butter. We’re not talking room temperature, but you should be able to leave an impression in it fairly easily. Allow plenty of time for it to reach this consistency, especially in cooler weather. And whatever you do, please do not use the microwave to soften it — 99.9% of the time it will get too soft, and it’s impossible to recover it at that point. 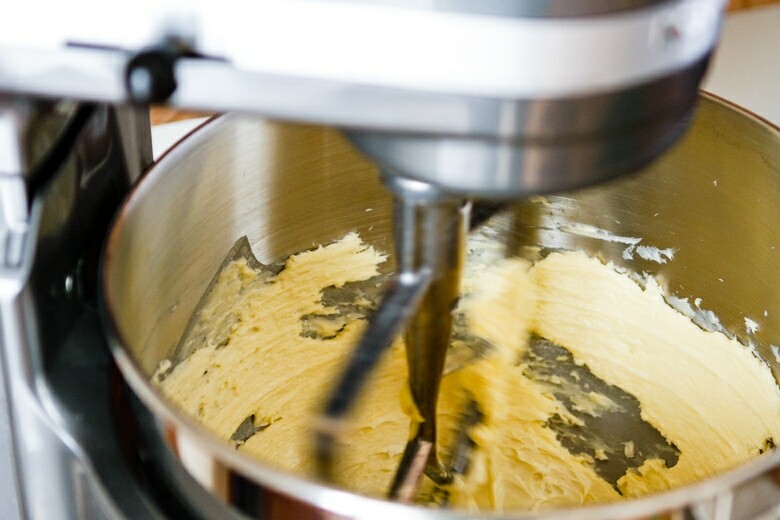 1| Add your softened butter to a stand mixer and beat it with a flat paddle for about three minutes on medium. 2| Turn the mixer off and add the confectioners sugar. Mix on low until thoroughly incorporated. 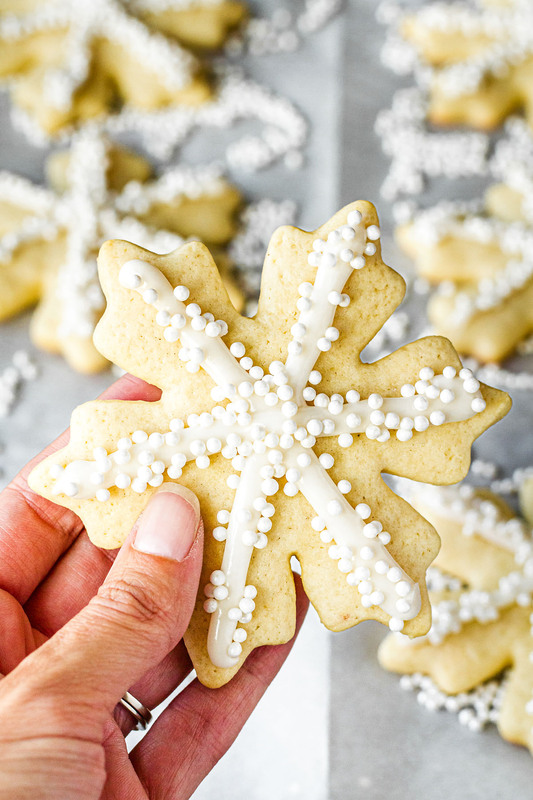 3| When the butter and confectioners sugar start to create a dough-like ball, you can add the vanilla extract and 3 tablespoons of heavy cream. Whip on medium-high for about three minutes. 4| Continue to add more heavy cream by the tablespoon until the frosting reaches your desired consistency. Less cream equals thicker frosting and more cream creates a thinner frosting. Voila! Is this an easy buttercream frosting recipe, or what?! If you’ve ever wanted to learn how to make whipped icing like Walmart, this is as close as you can get — but BETTER, in my opinion!!! For a batch of frosting that’s the consistency of what’s shown in these photos, I used a total of 4 tablespoons of cream. It was super creamy and fluffy, the perfect consistency for piping with a large tip onto my cupcakes. PIN IT NOW! CLICK HERE TO ADD THIS WHIPPED BUTTERCREAM FROSTING RECIPE TO YOUR DESSERT RECIPES BOARD ON PINTEREST! Super creamy and fluffy, not too sweet, and just 4 ingredients — this is quite possibly the best whipped buttercream frosting recipe ever… A must try! Using a paddle beater, beat the softened butter on medium speed for about 3 minutes or until it's a pale yellow color. Add sifted confectioners sugar and stir on low until incorporated. Add pure vanilla extract and 3 tablespoons of heavy cream. Beat on medium-high for 3 minutes or until light and fluffy, stopping to scrape the sides once or twice. If a thinner frosting is desired, add additional heavy cream 1 tablespoon at a time until desired consistency is reached. I used regular pure vanilla extract in this batch, which is why the frosting has a creamy color to it. 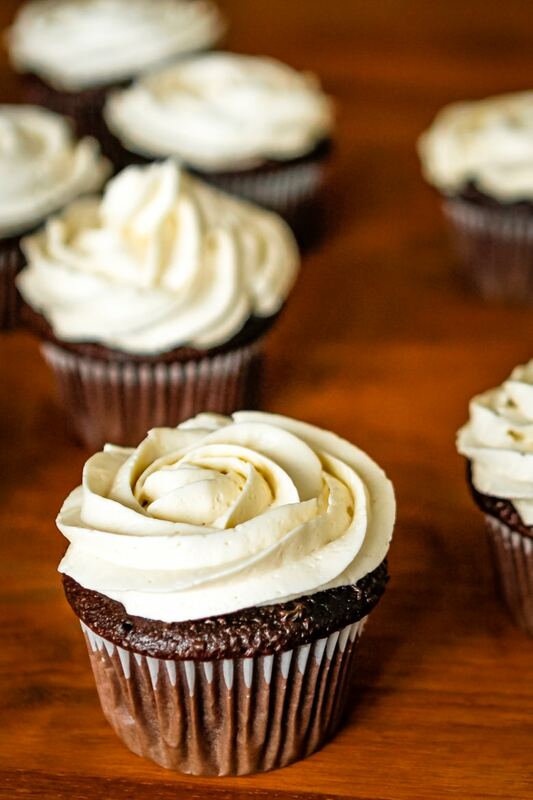 If you prefer a truer white buttercream, you’ll want to look for clear vanilla extract. I’ve had a number of requests for variations on this whipped buttercream frosting recipe, so I thought I’d start listing them here for easy access as I publish them. If you have a request, please contact me or leave a comment below! Chocolate Buttercream Frosting — coming soon! Cream Cheese Buttercream Frosting — coming soon! Peanut Butter Buttercream Frosting — coming soon! Lemon Buttercream Frosting — coming soon! Above all, have fun with this recipe! One last note — I used regular pure vanilla extract in this batch, which is why the frosting has a creamy color to it. 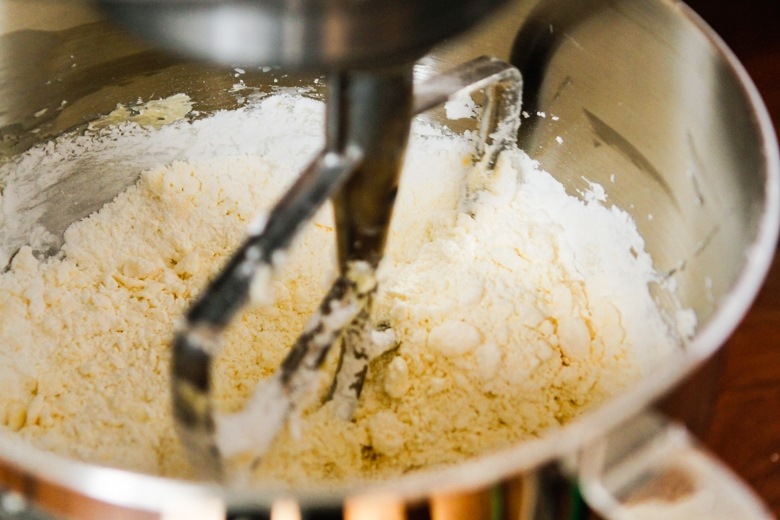 If you prefer a truer white buttercream, you’ll want to look for clear vanilla extract. I’d love to see how your whipped buttercream frosting turns out… Tag me @Unsophisticook on Instagram or use the hashtag #Unsophisticook so I can check it out. Enjoy! Hi Miranda! Yes, it will develop a crust after being exposed to the air. Would this work with a hand mixer? 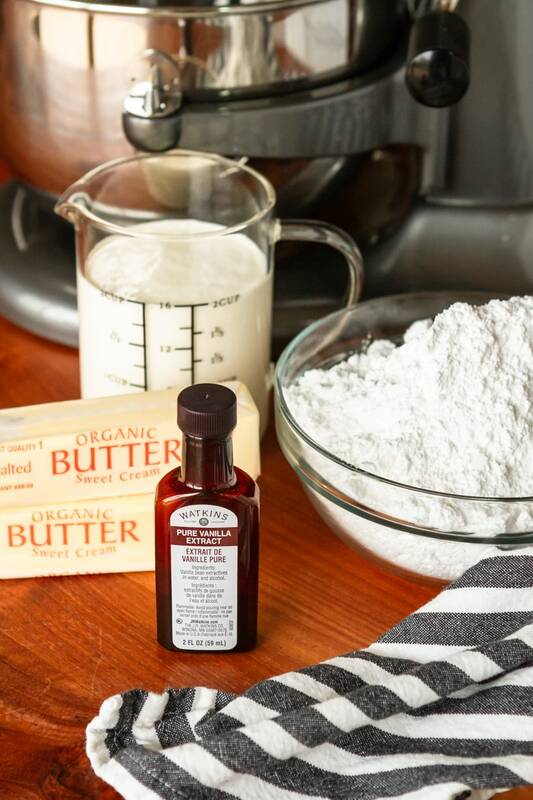 Yes, you can definitely make this buttercream with a hand mixer, Cate! It just may take slightly longer to whip. Can you make the icing ahead and just keep in refrigerator until ready ice the cupcakes? Yes, you can do that, Betty! I would just cover it with plastic wrap pressed down all the way on top of the frosting to prevent it from forming a crust. I typically make Swiss meringue buttercream but it doesn’t give me vibrant colors. How well does this frosting color? I’m trying to find a frosting not too sweet but holds color amazing. Hi Kristin! I’ve always been pleased with the colors. I’d recommend using a gel food coloring for best results. Looks SO easy and delicious! Need to try ASAP! I have not made buttercream frosting in a long time. After seeing this I think I’m going to give it a try! I don’t know if I’d even been able to get this on cupcakes or a cake without devouring it all with a spoon first. 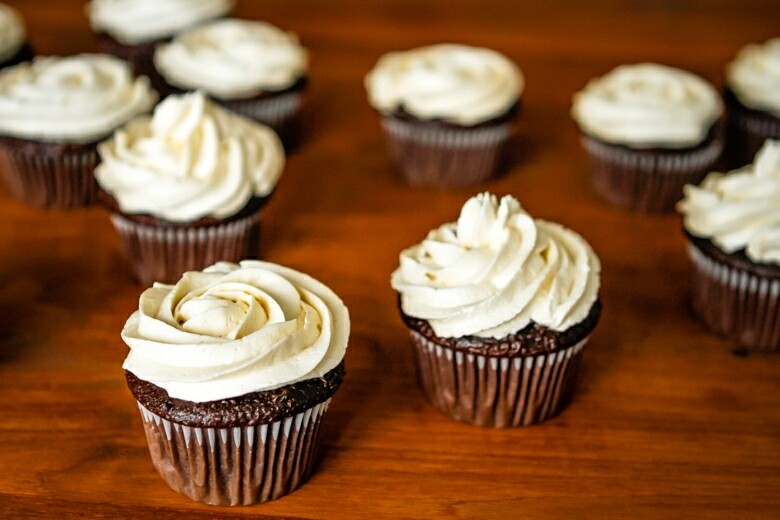 ;-) Seriously, the texture and flavor of this buttercream is dreamy! I love that this buttercream balances the sweetness. I’ve never been a fan of frosting that’s too sweet! 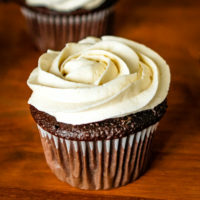 I seriously love a good buttercream frosting, and while I have my own favorite recipe, I’m totally going to try this one! Not too sweet and a buttercream using SALTED butter? I like your style!!! 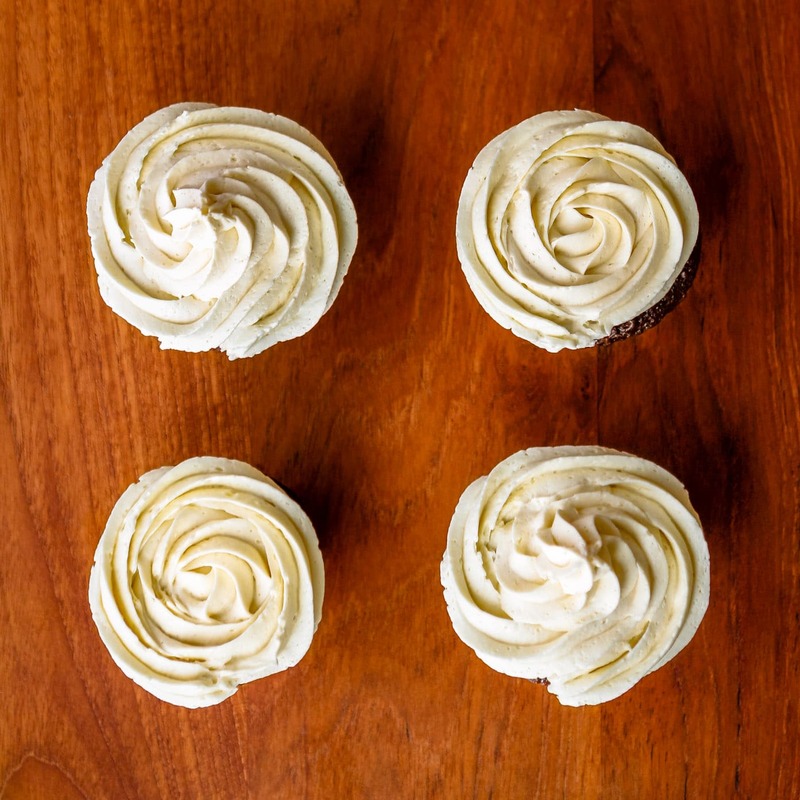 Totally going to try this recipe for whipped buttercream frosting! This buttercream frosting looks perfect! Love that it’s not overpoweringly sweet. 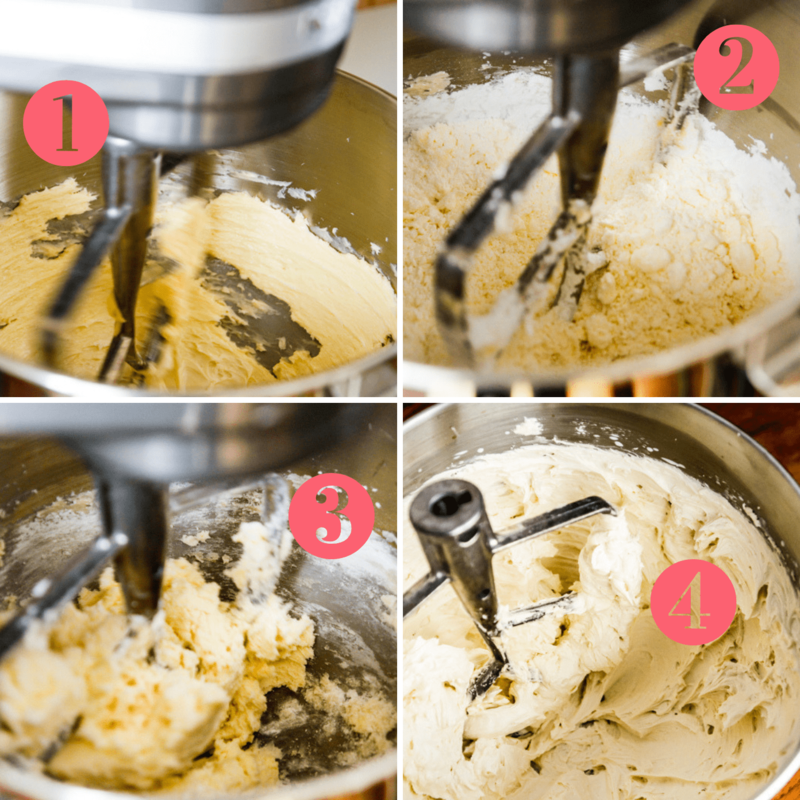 I love that I can make an epic frosting with just 4 ingredients! Its so easy to make too! I love this recipe I use it for different treats including cakes and everyone love it! Buttercream frosting is the best!! I love it on anything!! Thank you for sharing! This frosting always turns out so light and fluffy! It’s perfect for cakes and cupcakes! 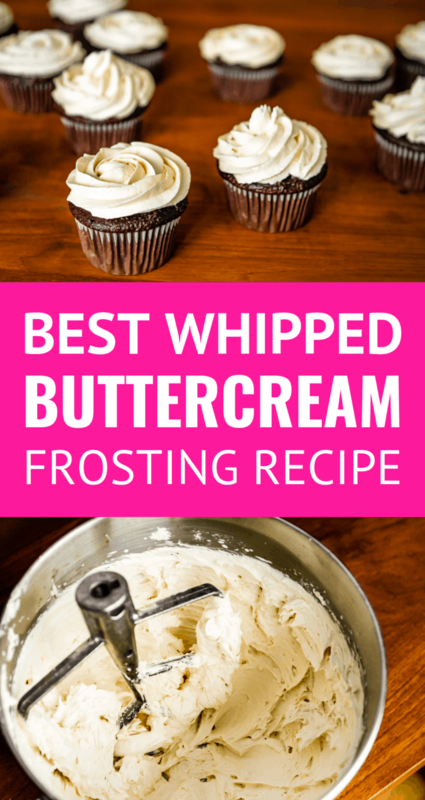 This Buttercream frosting is fantastic! Love it! This looks like the perfect buttercream frosting recipe! Yum! For the recipe posted, about how many cupcakes would you say it will frost? I would use a large tip in pastry bag as you sample shows. Just want to know how many batches I wil need to make! Thank you! Hi Jen! If you’re using a large tip and piping a generous amount, you should get about a dozen cupcakes from one batch. Enjoy! I have been looking for a buttercream that isn’t super sweet. 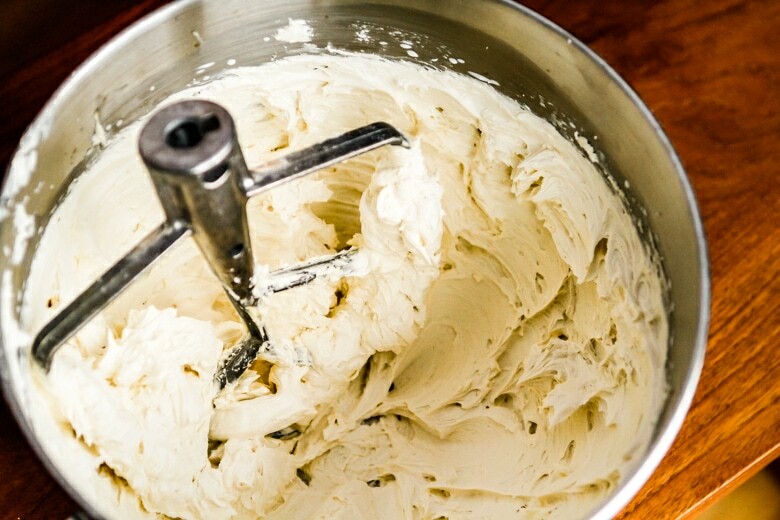 I make Italian buttercream alot but it’s alot of work and uses alot of butter. With this recipe can I do less sugar or make some adjustments to make it less sweet? Hi Colleen! I’m not a fan of achingly sweet buttercreams, so this recipe is already less sweet than a lot of other recipes I’ve tried. That said, sugar is necessary as a preservative, so I’d probably not use too much less. I’d recommend trying the recipe as written before making any adjustments. Does this icing work well for decorating cakes? I’m making a unicorn cake for my daughter’s birthday and I want something lighter than my traditional crusting butter cream. Hi Brandi! You should be able to get it to the consistency you want for decorating your cake by adding or subtracting some of the heavy cream. Hope you love it! Hi! I’ve been making your recipe for years with rave reviews (thank you!!). My son was recently diagnosed with a dairy allergy and I worried if I would be able to use this recipe anymore. I tried other recipes and they weren’t as good as yours, so I decided to try making it with vegan butter (Earth’s Balance) and full fat coconut milk for the cream… it turned out fantastic! :) I thought your other readers might like to know. Thanks again for an amazing recipe! Thanks so much for sharing this vegan option, Sheileen! If I don’t have heavy cream can I use milk instead or will that make a huge difference in taste. Also I’m icing a four tier cake with the middle cut out. Should I double the recipe you think? Hi Crystal! The buttercream will not be as fluffy and creamy with milk. You might get close if it’s whole milk, but otherwise the texture will be affected. It should still taste great, though. For a four tier cake, you’d definitely need to double it, maybe even triple if you’re filling in the middle. I love this recipe and always get compliments on it. Do you have a recommendation for chocolate version? Thanks!! i love buttercream frosting for my cakes and cupcakes but i think twice before eating myself or giving it to my son! The amount of butter and sugar scares me! I actually agree with you, Tina. I don’t have a problem with real butter, but we avoid added sugar when possible. This is a special occasion treat for us! I’m making your frosting today for my granddaughters Birthday cake. The party is tomorrow. It’s a 2 tiercake, so I can’t fit it in the frig. Question is, can it be left out at room temp until tomorrow’s party??? Thank you! Hi Mel! I’ve never had a problem with leaving it at room temperature overnight. It should be just fine. Enjoy! This looks amazing, one question, can I use this frosting to ice a cake? Thanks alot. You sure can! I use it on cakes all the time. Hope you love it, too, Lorena! as a professional baker i have searched ages for a buttercream that was not too sweet, and not swiss or italian because most americans don’t like it (I have have a brutally honest family fortunately). This buttercream saved my life for my sisters birthday, it is perfectly balanced. However, I did use unsalted butter with the tiniest dash of salt. when i say tiny, i mean barely noticeable in your hand lol. I find land of lakes brand of butter makes good icing. Thanks, I like Land O Lake and I appreciate your honest. Tomorrow is Thanksgiving and because of your comment I’ll try this recipe.